The Malaysian GDP expanded at a slower rate of 4.5% year-on-year in Q2 2018 (Q1 2018: 5.4% y-o-y). Malaysia unemployment remained unchanged at 3.3% (Q1 2018: 3.3%). Headline inflation as measured by the annual change in the percentage of the Consumer Price Index saw a decline to 1.3% in Q2 2018 (Q1 2018: 1.8%). A strong uptick in the Consumer Sentiments Index (CSI) was registered at 132.9 points in Q2 (Q1 2018: 91 points). The Ringgit remained under pressure and depreciated by 4.6% during Q2 to RM4.04 per US dollar. Sales volume declined by 2.0% to RM649.6m, dominated by retail and industrial assets. Sales were driven by winding down of a real estate fund and a corporate restructuring of a media group. Local REITs and trust funds continued to be major buyers, due to access to liquidity and funding. The threat of emerging market contagion and currency volatility were affecting foreign interest and making local buyers more cautious in the light of a slowing economy and escalation of a Transpacific trade war. Q3 saw the completion of 870,000 sq ft of office space, all of which are located within the KL Fringe. The prime office rent index in Kuala Lumpur City Centre (KLCC) registered a drop of 0.4%. The average occupancy rate in KL was 81.0%, a slight drop from 82.0% in Q2, as absorption rate lagged supply growth. Average prime rent in KLCC stood at RM7.30 per sq ft.
Retail sales recorded a lower-than-expected growth of 2.1% for Q2 2018. 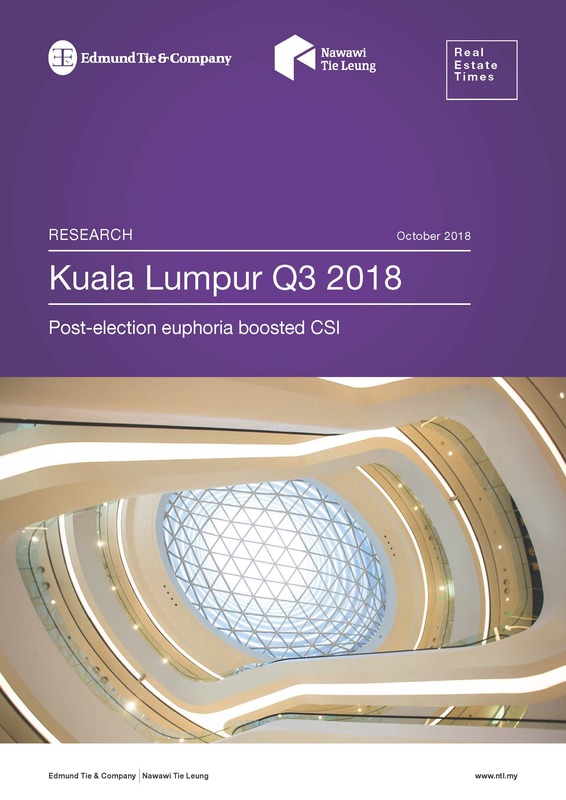 As of Q3 2018, the total existing supply of shopping malls in Klang Valley stood at 52.1m sq ft.
Eko Cheras Mall commenced operation in mid-September with 625,000 sq ft of NLA with an official opening expected in Q4 2018. Retail mall occupancy within KLCC is estimated at 93.0%, whereas the Outer City Centre (OCC) district and Other City Area (OCA) lingered at 85.0% and 90.0% respectively. Overall occupancy for shopping malls in Klang Valley is estimated at 89.0%. Four high-end residential projects in the city centre with a total of 1,177 units were completed in Q3. The completed projects are Four Seasons Private Residences (240 units), Tropicana The Residences (353 units), The RuMa Residences (200 units) and Anggun Residences (384 units). The number of completions accounted for 34.0% (2,093 units) of the pipeline for 2018 as of Q3, with some 4,083 units slated for completion in Q4 2018. About 49.0% of the upcoming supply will emanate from the city centre (Figure 9). Prices and rents for high-end strata homes stood at RM1,040 per sq ft and RM3.78 per sq ft per month respectively.